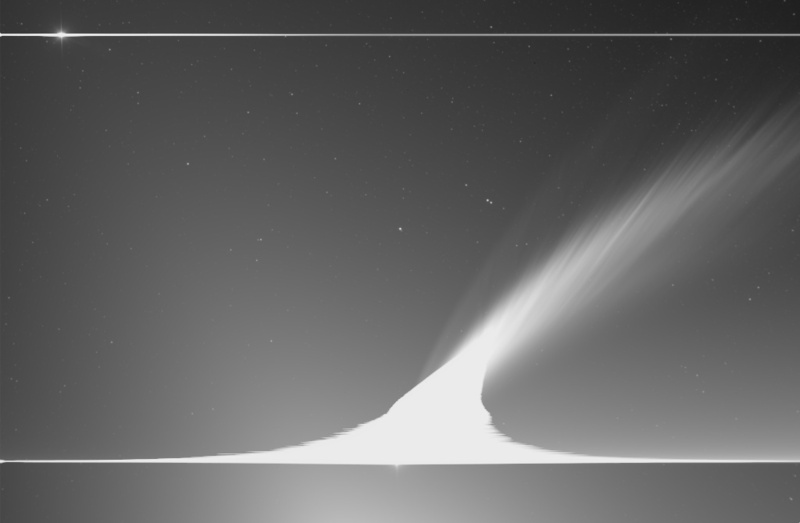 Explanation: Outstanding in planet Earth's sky early this year, Comet McNaught is captured in this view from the STEREO A spacecraft. McNaught's coma is so bright, it blooms into the long horizontal stripe at the bottom of the field. Brilliant Venus, near the top left corner, also produces a severe horizontal blemish in the digital image. But the sensitive camera does accurately record the striations in McNaught's famous dust tail along a region stretching over 30 million kilometers toward the top right of the field of view. A separate, fainter, arching tail just to the left of the dust tail was initially thought to be an example of a common ion tail, formed by electrically charged atoms carried away from the comet by the solar wind. However, detailed modeling indicates that tail is actually due to neutral iron atoms pushed out by the pressure of sunlight -- the first ever detected neutral iron tail from a comet. The iron atoms are thought to originate in dust grains from the comet nucleus that contain the iron-sulfur mineral troilite (FeS).